Some people think whales are just a large marine animal in the ocean with little importance to us humans and our world other than their sheer awesome size. What most people don’t realize is that those gentle giants are ecosystem engineers. Whales play a profound role in maintaining healthy oceans and, by extension, a healthy and biodiverse planet. Whales protect our planet’s health by reducing the amount of carbon dioxide (CO2) in our atmosphere. They sequester thousands of tons of carbon throughout their lifetime. Carbon sequestration is the long-term storage of CO2 and also other forms of carbon. This has been proven to mitigate the accumulation of greenhouse gasses in the atmosphere and in the marine environment. 3. Dying, or “falling”, naturally. The ability of whales to be natural CO2 regulators is one of the biggest reasons why whales are important to our marine ecosystem and to our world today especially given the impact of greenhouse gases and the correlation to global warming. 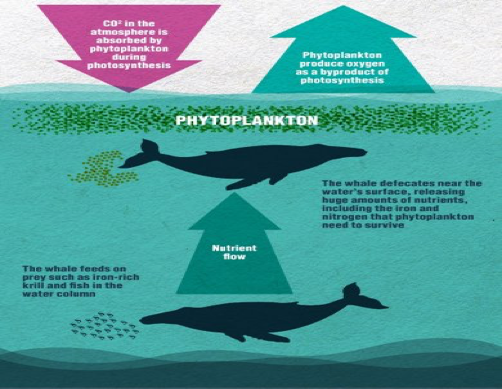 Phytoplankton are microscopic plants in the ocean, and whale feces is food for them. Whale or dolphin feces are nutrient rich and provide food to phytoplankton, which grow, spread, and serve as effective absorption shields for CO2. The challenge is that whales feces quickly sink and become inaccessible to phytoplankton that need sunlight to propagate. Fortunately, ocean currents and eddies churn the water columns and through a process of upwelling cause nutrient mixing and make them available to phytoplankton. The feces encourage the growth of phytoplankton populations and a large rise in these populations results in what is called as a phytoplankton bloom. These blooms then become capable of sequestering, or removing, thousands of tons of carbon. Did you know that phytoplankton and other marine botanicals produce at least half of the oxygen we breathe! That means that the oxygen in 1 out of every 2 breaths we take is produced by the ocean. Much like plants, these phytoplankton do this through photosynthesis. They take in the CO2 through pores, convert it into sugar for food, and expel the oxygen. In addition to being the building block of the food chain, phytoplankton also play an important role of being a biological indicator. This means that the phytoplankton provide us with an early warning of climate change. The production of phytoplankton is dependent on nutrient availability and water temperature. So climate change stands to affect the timing of these phytoplankton blooms, which in turn cascade up the food chain. Whales play the role of a major carbon sink. What this means is that carbon readily “sinks” or gets absorbed by the whale, which consequently becomes a storage unit. In fact, the most amount of carbon stored in a whale is 18,000 pounds. This is also the reason why whaling majorly affects the environment and us. As Andrew Pershing, a research scientist who participated in a joint study with the University of Maine and the Gulf of Maine Marine Research Institute, said “A century of whaling equates to the burning of more than 70 million acres of forest or 28,000 SUVs driving for 100 years.” He also added that “by removing whales, sharks and large fish, we’ve reduced the amount of carbon stored in these populations.” What this means is that by killing whales, the carbon stored in their bodies is released into the atmosphere which reverses this important carbon sink process. To paraphrase what Andrew Pershing said, researchers estimate that 100 years of whaling and taking those whales from their ecosystem has reversed the carbon sink process and released thousands of pounds of carbon back into the atmosphere. Additionally, research shows that in ecosystems most impacted by whaling the species of smaller animals had increased. Compared to the smaller animals the bigger animals require less food (carbon) which makes them more efficient. To quote Andrew Pershing again “In many ways bigger is better. Larger organisms are more efficient, requiring less food per unit in their bodies”. But why isn’t a whale dying naturally the same as killing it in terms of carbon storage? This brings us to the third and final point. A Whale “Fall” happens when a whale dies and its carcass sinks down to the ocean floor. When this happens, the carcass takes all of its stored carbon down to the ocean floor where it can never be released again. The whale carcass can become a mini-ecosystem that supports the deep-sea creatures in the area. When this happens there is about 2 metric tons, or 4409.25 pounds, of carbon stored in an average 40-ton carcass. Whales are a part of the biological pump, a major contributor to the oceanic carbon cycle. What is a biological pump? A biological pump is the ocean’s naturally occurring process of sequestering or taking carbon from the atmosphere and transferring it to the deep ocean to be stored for a long time. This has been proven to mitigate the accumulation of greenhouse gases in the atmosphere. I hope this is news that will excite you as it does me and makes you want to protect the CO2-regulating gentle giants that swim in our beautiful oceans. Now let’s talk about how what we can do to protect these creatures that give so much to our health. 1. Write to your Senator and Congressional Member to protect marine mammal populations and their habitats from human activities that harm them. 2. Be aware of your choices and actions daily, because whether it’s the choice to eat that plastic wrapped salad or to flush your cat’s poop down the toilet, they all affect the health of the ocean. Reduce the use of plastic bags and plastic in general as they impact marine life all the way up the food chain. 3. Educate yourself not only about whales but all of the larger problems that the oceans are facing. 4. Donate to ocean-protecting organizations, sponsor and sign petitions to protect whales. 5. Support any and all efforts to increase carbon sequestration. If we form a globally large movement of aware and responsible people, then we can help our oceans with all of its inhabitants including whales thrive and continue to help us. Then we can all breathe and live together. Administration, National Oceanic and Atmospheric. “PLANKTON: Why Are They Important?” COPEPOD: Why Are Plankton Important? National Oceanic and Atmospheric Oceanic and Atmospheric Oceanic and Atmospheric Administration , www.st.nmfs.noaa.gov/plankton/intro/why.html. Foundation, National Science. “Spring Plankton Bloom Hitches Ride to Sea's Depths on Ocean Eddies | NSF - National Science Foundation.” National Science Foundation - Where Discoveries Begin, 26 Mar. 2015, www.nsf.gov/news/news_summ.jsp?cntn_id=134551&org=NSF&from=news. Hub, Science Learning. “The Ocean and the Carbon Cycle.” Science Learning Hub, 22 June 2010, www.sciencelearn.org.nz/resources/689-the-ocean-and-the-carbon-cycle. Maine, University of. “Whaling and Fishing for the Largest Species Has Altered Carbon Sequestering in Oceans.” Phys.org - News and Articles on Science and Technology, Phys.org, 6 Sept. 2010, phys.org/news/2010-09-whaling-fishing-largest-species-carbon.html. Part 1: What Causes a Bloom?” Predicting Phytoplankton Bloom in the Gulf of Maine, Earth Exploration Toolbook, 8 Nov. 2016, serc.carleton.edu/eet/phytoplankton/primer.html. Reay, Dave. “Carbon Dioxide Sinks - Oceans.” CO2 Sinks - Oceans, GreenHouse Gasses Online, www.ghgonline.org/co2sinkocean.htm. Zielinski, Sarah. “A Whale of a Carbon Sink.” Smithsonian.com, Smithsonian Institution, 1 Mar. 2010, www.smithsonianmag.com/science-nature/a-whale-of-a-carbon-sink-24553422/. Figure 2 and 3: Andy Pershing on October 16, 2009 11:05 PM, and Wadard | March 3, 2010 3:33 AM | Reply. “How a Whale Is like a Tree.” How a Whale Is like a Tree - Seascape Projects, www.seascapemodeling.org/seascape_projects/2009/10/how-a-whale-is-like-a-tree.html. Land-Sea Pollution: Are California’s Marine Protected Areas Really Protecting Marine Life?